The U.S. Food and Drug Administration has approved a prescription form of cannabis oil as treatment for patients with two rare forms of epilepsy. A West Des Moines mother whose daughter has chronic epilepsy says the move means insurance may cover this new drug that’s derived from the marijuana plant, but does not contain the chemicals that cause the “high” associated with recreational marijuana use. “I think it opens up a population that number one could not move to Colorado to try anything and number two could not afford to use hemp products in the quantity needed to be effective,” said Sally Gaer. Gaer’s daughter Margaret has Dravet Syndrome. This is the first drug specifically identified as prescription treatment for the condition, but Gaer said it may not be the right choice for her daughter. Gaer indicated the newly-approved, cannabis-based drug is not the same kind of “full-spectrum” medication as the cannabis oil her daughter is taking. 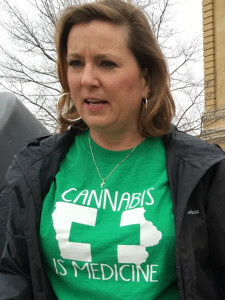 Gaer is among a group of parents who successfully lobbied legislators to decriminalize possession of cannabis oil as treatment for chronic epilepsy in 2014. Gaer was also among those who successfully urged lawmakers to expand the law in 2017 so cannabis oil could be produced and dispensed in Iowa, for a wider range of medical conditions. Distribution of Iowa-manufactured cannabis oil is scheduled to start in December.